After releasing a new line-up of MateBooks earlier this year, Chinese electronics giant Huawei has now refreshed the MateBook D in China. The new laptop comes with upgraded 8th-gen Intel processors, and a new graphics card from Nvidia. Huawei’s refreshed MateBook D is similar to the one launched earlier this year in all other aspects, including its 83% screen to body ratio, and the 45% coverage of the NTSC color gamut. The screen is also rated to have a maximum brightness of 350 nits, so it should get bright enough. 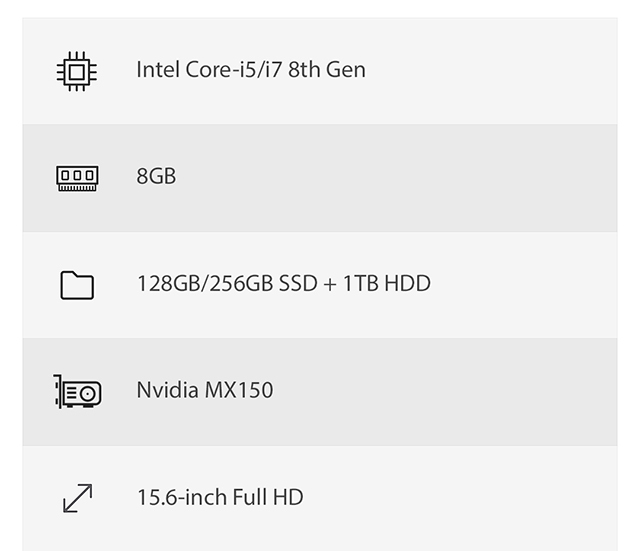 In terms of the GPU, it features Nvidia’s MX150 card, which takes the place of the Nvidia 940MX GPU, from the last-gen Matebook. The laptops come bundled with a lightweight charging adapter, and are equipped with ports including two USB 3.0 ports, a USB 2.0 port and an HDMI port. Plus, for audio enthusiasts, the laptops boast speakers that have been developed as a joint effort between Huawei and Dolby Audio. Other improvements to the new MateBook D include a dual-band WiFi receiver for increased range, along with a built in 43.3kWh battery that Huawei claims can offer up to 10 hours of battery life, and 8.5 hours of video playback. The MateBook D comes with Windows 10 pre-installed. All of the three variants have gone on sale in China, but the company has not made any announcements regarding availability in other regions, which is expected to be made clear at CES 2018.